As I write this we are anxiously awaiting with baited breath to see how successful President Trump is with Kim Jong-un at the NOKO Summit and to see if this week's release of the 'supposed' final investigative report into Hillary Clinton's email scandal points to her finally being called to task. However, there are still two other ongoing investigations of note that should be addressed and these both go directly to top of the ever-growing Democratic trash heap...landing squarely, as they should, at the feet of former President Barack HUSSEIN Obama. And to this affect, last week the 'Senate Permanent Subcommittee on Investigations' Chairman Rob Portman (R-Ohio) released to the public their findings* regarding certain questionable actions of former President Barack HUSSEIN Obama. In effect proving that with malice intended, Obama lied to both Congress and to 'We the People' about certain key elements of the Iranian nuclear deal itself (the Joint Comprehensive Plan Of Action aka JCPOA) as well as about his secretly trying to give Iran access to the U.S. banking and financial systems in order to allow them to convert billions of dollars in assets into Euros. And he did so as part of his desperate attempt to seal the Iranian nuclear deal even while U.S. sanctions against Iran where still in place...in other words the U.S. be damned. First some background information. One of the 'supposed' key components of Obama's (very bad) nuclear deal was that it would see a “near-ban” on the Iranian regime having any access whatsoever to our U.S. banking and financial systems. However, as per the committee's findings, on his orders Obama officials “pushed” both the Treasury and State Departments into working behind the scenes to help Iran...the world's leading state sponsor of terrorism...gain access to much needed monies while he and his cronies spewed rhetoric to Congress that Iran would never gain access to any part of said banking or financial systems. "Iranian banks will not be able to clear US dollars through New York, hold correspondent account relationships with US financial institutions, or enter into financing arrangements with US banks." So said Democrat Adam Szubin, the Department of the Treasury's acting Under Secretary for Terrorism and Financial Intelligence during the Obama years...but guess what he lied while Obama of course smiled. 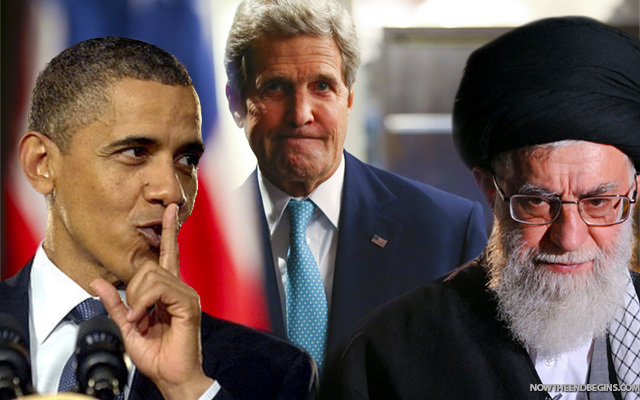 And with those assurances not withstanding, on February 24, 2016, Obama's Department of State “instructed” the Department of the Treasury to issue the required license**...a permit if you will...to let Iran “sidestep” in-place sanctions for as long as it took them to convert funds through an American bank. And after issuing said license...a license which including giving Iran unlimited future access to their deposits as long as the license was in place... these Obama folks denied to Congress...lied to Congress...that it had done so. So what do the funds in question actually consist of...how about $5.7 billion of Iran's overseas reserves garnered from oil sales and from the still “frozen” 1979 sanctions... sanctions derived from monies paid for by the then Shah of Iran's government in regards to a $400 million delivery of fighter jets from the U.S...remain the sanctions held in Oman's Bank Muscat. Frozen in rials...Oman's currency... which are difficult to convert...led Iran wanting to convert them “briefly” into U.S. dollars and then into Euros...something Obama was more than willing to do if Iran "signed" on the nuclear deal dotted line. However, Obama's plan failed when officials from the Treasury's Office of Foreign Assets Control (OFAC) “encouraged” (threatened is more like it) two U.S. banks to act as the intermediaries and carry out the converting of funds. But thankfully both banks refused to take part in what they claimed could cause a potential serious regulatory backlash “due to compliance, reputational, and legal risks associated with doing business with Iran.” Translation...the bank's hierarchy were smart enough to know that what was actually being asked of them amounted to treason. And now with this report we find that official Department of State emails were found admitting that the Obama administration had indeed overstepped their bounds and “exceeded our JCPOA commitments.” And to make matters worse, the Senate report also disclosed that Obama's people, including “friendly” bank regulators, put on what they referred to as more than 200 “roadshows” around the world where they “encouraged” foreign financial institutions to do business with Iran “as long as the rest of the world left the United States out of it”...at least kept us out on the surface that is...while assuring said financial institutions who did so that they would get nothing more than a mere slap on the wrist for violating U.S. sanctions if caught. Nothing like the thrill of covertly helping Obama's brethren screw the U.S. it seems. So let's summarize the main infractions of this first investigation of note...and know that said actions described herein do, I believe, reach the definition of treason as per U.S. Code 2381, in that they give “aid and comfort” to the enemy. First, Obama and crew told Congress it would not allow Iran access to U.S. financial institutions under any conditions...which we now know was a lie. Second, the Department of the Treasury on orders from the Department of State issued a special license that would allow Iran to do exactly that no matter that they unsuccessfully tried to “pressure” two U.S. banks into helping the regime get their much wanted monies. And third, all parties involved lied to both Congress and 'We the People'...parties from Obama on down...about their actions and 'supposed' inactions, and continue to do so even though they have been caught. And all the above...and much more...was done ever so discreetly with it never intending to be disclosed. And when it comes to treason, intended actions are just as damning as actions successfully taken. And loyal Democrats are now circling the Obama wagon to chime in that what's the big deal as no actual U.S. laws were broken since no actual transactions took place. In fact, Treasury officials loyal to Obama claim these transactions would have been legal if they had taken place because the terms of the JCPOA were "consistent with Iran's position, allowing the Government of Iran to engage in 'transfers,' 'foreign exchange (including Rial related transactions),' and the 'purchase or acquisition by the Government of Iran of US bank notes.'" Really, pray tell how is knowingly and willingly aiding in the releasing of monies that would assuredly go into helping the enemy commit even more acts of terrorism not be treason...simply it is. And don't ever forget that no U.S. president, whether they be Democrat or Republican, believed any of those “frozen” monies should be returned to those sorts who helped to overthrew the then western aligned government of the Shah or to any of those who now continue to chant “Death to America” and “Death to Israel” time and time again...until Barack Hussein Obama that is. And that leads me to another in-our-face act of treason willingly committed by then President Obama and crew. The Trump administration has now traced back some... but not all...of the $1.7 billion ($400 million from originally frozen Iranian assets plus $1.3 billion in interest) Obama actually did release to Iran...monies that were indeed in affect ransom...a bribe...monies paid for the release of four American hostages...hostages who not so surprisingly just "happened" to be released on the very same day the monies arrived via an unmarked cargo plane in the dead of night back on January 17, 2016. Now remember how the Obama controlled Department of Justice tried to get us to believe that it is not a federal crime to “pay” a ransom, that it's just a crime to “receive” ransom. Well that's simply not true as it surely is a crime when the payer...as in an American president...knew well that government-paid ransom is barred under U.S. law, and that those monies would in turn be monies Iran transferred over to some of the many terrorist groups they finance...groups like Hezbollah and the Iraqi Shia terrorist group Kata'ib Hizballah (KH) to name just two. And this act of paying ransom adds to the fact that America's 44th president was not on America's side. And that's in addition to the fact that paying ransom only encourages kidnappers and terrorists to take even more hostages, which is exactly what Iran has done since Obama paid them the monies they demanded. But as for the legalities of why this deal is treason...while the White House contended that the payment did nothing but settle the above mentioned decades-long what they called a “financial dispute,” and that the settlement was fully disclosed in January, neither Obama nor White House officials made mention that the $400 million arrived in Iran at the same time as the hostages were freed. Nor did they mention that normally a bank transfer would be used for that type of deal...if said deal was indeed legitimate that is...instead these miscreants used the excuse that since Congress banned dollar transfers to Iran our government was "forced" to buy foreign currency...as in Swiss francs, euros and other foreign currencies...with those currencies then being transferred to Iran in cash. So while the cargo plane was unmarked, and while the monies were in foreign currencies they were still paid and substituted for American cash...and all this was kept secret from 'We the People' and would have remained so if not for the fact that The Wall Street Journal broke the story almost eight months later on August 2, 2016. But why keep this payment secret from the American public if indeed this deal was on the up-and-up...as in monies paid for a purchase not yet delivered. And why do Obama's minions continue to insist that the U.S. did the right thing by his settling this almost 40-year old "issue"...especially since the Iranians claimed then and continue to claim now that the monies were indeed a ransom payment made. And so it all boils down to the fact that this deal was but one of Obama's many traitorous actions...the Taliban 5 trade for American deserter Beau Bergdahl quickly comes to mind as yet another...and dare we not forget the nightmare that was Benghazi. Yet even to this day islamic-condoners and those of the uber bleeding heart liberal persuasion continue to say that, “It was their money. It belonged to the Iranian government.”...the fact remains that when Barack HUSSEIN Obama keeps something major from the American public and then lies about it even when caught, you just know that “there's something rotten in the state of Denmark” as the old saying goes. So by his giving “aid and comfort” to the enemy on both of the accounts I stated, Barack HUSSEIN Obama is guilty of treason...and in my so humble opinion should be given either a bullet or a rope as his one and only choice of punishment. No “get out of jail free” card must again be issued as it was with Benghazi and with the Taliban 5 trade, and most surely no simple fine should be the sole punishment adjudicated. And as to a prison sentence being yet another option that U.S. Code 2381 provides, I, and I'm sure countless others, do not want even one dime of our hard-earned taxpayer dollars being spent on keeping a traitor...on keeping Obama...alive...alive for decades let alone mere years. Like I said...a bullet or a rope will be more than enough to suffice for his crimes committed, after all if it was good enough for Benedict Arnold it's good enough for the traitor that is Barack HUSSEIN Obama...case closed. 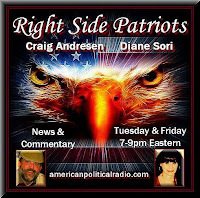 Today, Tuesday, June 12th from 7 to 9pm EST on American Political Radio, RIGHT SIDE PATRIOTS Craig Andresen and Diane Sori discuss 'Two Acts of Treason...Obama Style'; 'The Clinical Term for Liberalism'; and the NOKO Summit. William Bowles and Robin Larson like this. For future reference, it's bated breath. It's a diminutive of abated, meaning breath that is held. Unless you've been eating worms. In which case, "baited breath" fits. You both criticize a single word...that's what you focus on in an article abut Obama's treason...you must be liberals. And BTW, according to 'spell check' it can be written either way. Not a typo, Diane. You used the WRONG word. Stop trying to distract and admit your mistake like a grown-up. You must be a child. where do I say typo in my comment...duh. And to focus on a single word...you must surely be an Obama or hillary-ite...or a sick little whiny snowflake. Cute how you EDIT your post previous to mine. You are a FAKE journalist and an even more FAKE human being. You are a sick, sad fool. lol, Some people like to give the impression that they are super intelligent by correcting others Diane. Just consider the source. Then another person with the same mentality puts a like on his berating comment. It's about accuracy in communication. If you don't care about accuracy, that's your problem. Pretty certain Neanderthals felt the same way. Iy's about your side losing the election...period. Maybe if you go back to grammar school, Diane, you can learn how to write and SPELL. Sheesh, you are a pathetic loser. I wasn't criticizing, Diane. When I saw the phrase, I wondered about the spelling, looked it up, and passed the information along. If you want to be considered a journalist, embrace the language. I am a journalist... and have been for some years...and BTW everything is run through 'spell check' and that is how it came up. And to ficus on that and NOT article content is truly a sign of the uninformed or misinformed...in other words a liberal. Are you purposely misspelling words now? You consider yourself a journalist? You are more of a comedian than a journalist. You cannot write, you cannot spell, you cannot communicate a coherent thought. A journalist writes news and facts. An editorialist writes opinions. You're the latter. A journalist wouldn't use photo shopped pictures to illustrate a story.